Many patients have asked why we don't advertise ourselves as holistic dentists. As Dr. Tan puts it "We aren't holistic, we're realistic". While our approach to dentistry is probably considered holistic, there are many aspects of holistic health that we do not promote (i.e. charging additional fees for unneccessary procedures). A lot of our patients have health concerns and we work with each patient individually to listen to their health and dental goals. Blood is composed of blood cells and plasma, which contains platelets and stem cells. This cell rich portion is known as Platelet Rich Plasma (PRP). Platelets contain many components, including platelet-derived growth factor (PDGF), bone morphogenic protein (BMP) and transforming growth factor beta (TGF-β), which have been shown to accelerate wound healing and promote the formation of new cells. This has made PRP a valuable adjunct in dentistry because it accelerates post-surgical healing. PRP’s ability to stimulate stem cells has made it an effective addition to implant, bone grafting and oral surgery procedures. It can accelerate cell regeneration and has been shown to ensure long term success of implant procedures. PRP is obtained from a small sample of the patient’s own blood. The blood is then centrifuged to separate the plasma (which contains the growth factors) from the red blood cells. 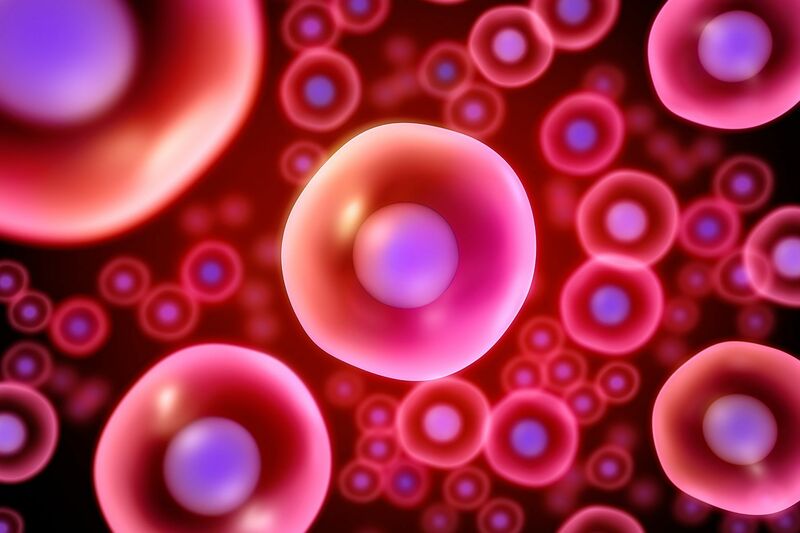 PRP uses the body’s own cells, rather than a donor cell, to speed up the healing process. Because such a small sample of blood is required, the patient can have it done during an outpatient procedure (like oral surgery) and does not need to go to the hospital or a phlebotomy lab. Depending on the procedure, PRP can be used on its own or mixed with bone. 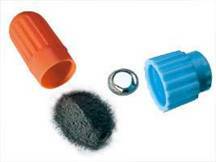 PRP on its own can form membranes and plugs so that we no longer need to use synthetic materials. This reduces the inflammation in the body (from the foreign material) and contributes to a more successful surgical outcome. When used with bone grafts (usually from donor bone), it can help the success of the graft or implant due to the growth factor and bone-growing proteins contained in the plasma. PRP is a safe, convenient procedure and is a beneficial adjunct to surgical procedures. It is not required in every case, but when indicated it promotes faster healing and decreased post-surgical discomfort. Contact our office to see if you would be a good candidate for PRP. For our patients who are missing multiple or all teeth, dentures are a great option to restore function, esthetics, and your smile. However, some patients find that they are bothersome to take in and out and would rather have a fixed solution. A hybrid overdenture is a denture that is anchored to the bone with dental implants. It is contains prosthetic teeth and gum tissue. The mandibular hybrid denture can be fixed on four implants and the maxillary hybrid denture usually requires six. Our implant hybrids are constructed of Zirconia. Zirconia is similar to Cubic Zirconia, which is what synthetic diamonds are made of. Zirconia is the strongest, most durable material in dentistry. Unlike acrylic hybrids (also an option), Zirconia is not prone to wear, chipping, and discoloration. If you are considering implant hybrid bridges or overdentures, give us a call to schedule an appointment for a consultation! Crowded Teeth…what are my options? What would you change about your smile? Some people love the shape and color of their teeth, but are dissatisfied with the alignment of their teeth. Yeo Family Dental Group has a solution for you. For gaps between teeth, we can bond composite material to fill the space between teeth. This is good for minor cases. For all other tooth misalignment cases, we can evaluate whether or not you would be a good candidate for Invisalign or Fastbraces. Invisalign uses clear aligners that are virtually invisible and fit snugly over your teeth. Each aligner shifts your teeth slightly, moving them horizontally and vertically and even rotating them when needed. You wear the aligners for 20-22 hours a day, removing them when you eat and brush your teeth. We typically see patients every 6-8 weeks to check your progress and give you a new set of aligners. This is an option that many of our patients in the entertainment industry wear, just in case you need to remove them in order to go on an audition or to film a scene. 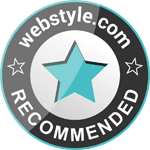 Fastbraces is another great option. They look like traditional metal brackets (also come in clear). The great thing about Fastbraces is that they are, well, FAST! The design of the bracket itself is made so that it can safely and effectively move teeth into an optimal position. Treatment time is usually in the span of three months or less, but can vary with each case. Call to schedule a consult with Yeo Family Dental Group to help you achieve your best smile! We look forward to seeing you soon. Many of our patients come to our office to ask about how they can improve their smile. Whether it be the gaps, the tooth shade, or the overall look of a patient's smile, these little imperfections may prevent you from smiling fully and can impact your facial features, mouth and confidence! Our office provides many conservative options to help improve your smile without sacrificing your natural tooth structure. Zoom Whitening is a one hour, in-office procedure. Zoom! is safe, effective, fast & performed only by dental professionals. The Advanced Power Chairside Lamp accelerates the bleaching process by activating the hydrogen peroxide whitening gel. As the hydrogen peroxide breaks down, oxygen penetrates the teeth to whiten the discoloration. Zoom! is a convenient option for busy individuals who do not have time for gradual whitening. You can also whiten your teeth at home in a matter of a few days using our advanced at-home whitening kit. Both comfortable & affordable, our at-home whitening involves you wearing a specially crafted tray for a few hours in order to achieve a surprising difference in your smile. We create custom fit take home trays for you and a professional-grade bleaching solution to be worn to achieve the desired whiteness. Contact Yeo Family Dental Group today for a free smile makeover consultation! We can help you achieve a beautiful and healthy smile. We can design porcelain veneers to fit the exact shape, style and shade to fit your needs. Our veneers require minimal to no tooth preparation. The advantage is that the tooth is left completely intact, meaning you retain your natural tooth structure and the procedure is more comfortable and non-invasive. This can be done in two to three visits. The first visit involves an impression, the second we place the temporaries on, and the third visit involves delivering of the final veneers! The veneers are extremely thin and made of porcelain. We try to make them beautiful without looking artificial. For patients who are not quite ready to get veneers, bonding is a great way to gently ease into changing your smile. It involves one visit, and you can leave with a smile makeover! With chairside bonding, Dr. Yeo and Dr. Tan place composite over your natural teeth. We then shape the composite (the same material used for tooth-colored dental filings) into your new look. Throughout the process you can tell us if you don't like the shape or length of the tooth...or if you change your mind! The best part about chairside bonding is that it is non-invasive, painless and completely reversible. If you play contact sports, it’s recommended that you wear protective gear. 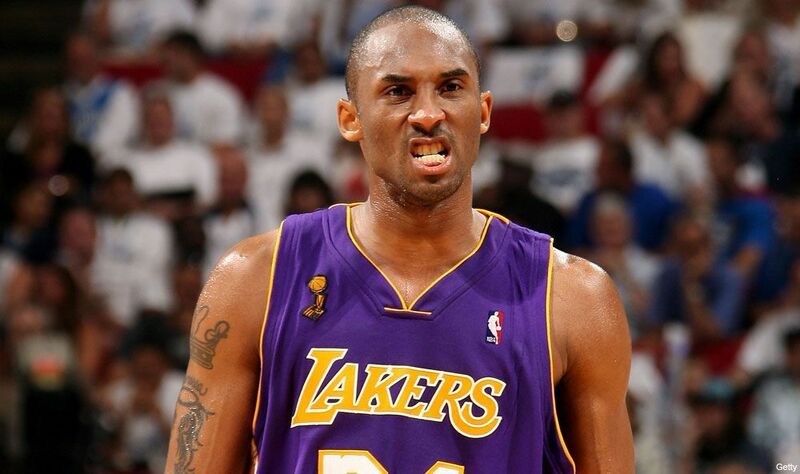 We always remember to grab our helmet, shin guards, and elbow pads…but what about a mouthguard? Orofacial injuries are extremely common in people who participate in sports such as basketball, baseball, boxing, horseback riding, gymnastics, surfing, and hockey. 10-39 percent of dental injuries in children are due to sports related accidents. The National Youth Sports Foundation for the Prevention of Athletic Injuries estimates that during a single season of play, athletes have a 10% chance of sustaining an injury to the face or mouth. The two front teeth are the most commonly injured. The Academy for Sports Dentistry (ASD), American Academy of Pediatric Dentistry (AAPD), American Association of Oral and Maxillofacial Surgeons (AAOMS and the American Dental Association (ADA) recommend the use of properly fitted mouthguards in any sport that carries the risk of facial injuries. One small little mouth guard can protect against painful and traumatic injury. When we make sports guards in our office, we pressure form them to a model of your teeth. This allows for consistent shock absorption and force distribution across all your teeth…thus, more protection! It’s also a lot more comfortable for you to wear when playing sports. The last thing you need is one more uncomfortable piece of protective equipment to wear. Our comprehensive patients who participate in contact or team sports receive a free dental guard in their team colors with their number on it (if you have a jersey number!). Contact our office today to schedule an appointment! Newsome P, Tran D, Cooke M. The role of the mouthguard in the prevention of sports-related dental injuries: A review. Int J Paediatr Dent 2001;11(6):396-404. Aaronson, H. (2017). Physics of Protection - Athletic Mouthguards. Decisions in Dentistry, 3(7), 24-27. American Academy of Pediatric Dentistry . Policy on Prevention of Sports-related Orofacial Injuries 37(6). Now more than ever, dental patients are more concerned and more educated about the materials being put in their bodies and the impact this can have on their health. With regards to dental implants, it is important to use biocompatible materials and to consider clinical success. properties. They have great long-term success and low risk of complications. The treatment of the titanium surface allows for osseoinegration of the implant. However, corrosion of implants has been identified as one of the mechanisms that result in the failure of dental implants (Gittens et al. 2017). This occurs when the titanium metal reacts electrically with other metals in the mouth. The long term effects of titanium corrosion remain unclear. Titanium implants remain the standard used in the dental industry.They have a long-term success rate of 94-97%. Zirconia implants are an alternative to titanium implants. They were released in 1987 and have been marketed as a non-metal, ceramic material that has similar advantages to traditional titanium implants. Zirconia implants are white, which means that no dark metal color will show through the gums (which can happen in some cases). Zirconia has very little metal component and has no corrosive properties as seen in titanium. However, Zirconia has a higher risk of fracture due to the properties of the material. 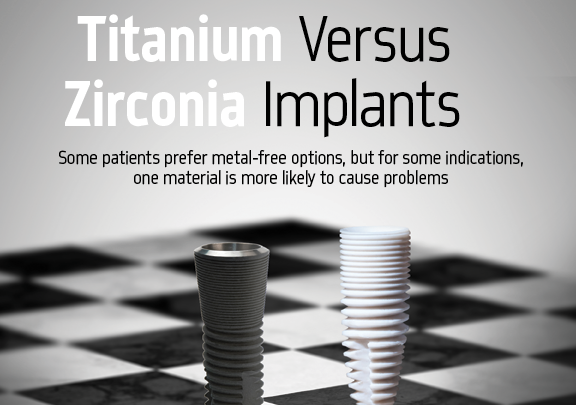 Zirconia implants are favored for people who have titanium allergies. However, true titanium allergies are extremely rare with a prevalence as low as 0.6% (Sicilia et al. 2008). Zirconia implants come in a single abutment system. This means that implant components that connect the implant to the tooth is the same component that is located in the bone (whereas they are separate in the titanium systems). This means they must have cemented crowns. Custom abutments and screw retained implant restorations are often necessary for full mouth implant treatments, which eliminates the possibility of zirconia implants in these cases. Studies have shown that both implant materials have very similar bone to implant contact (Manzano et al. 2014). Both materials are biocompatible and do not cause local in flammation and are not rejected by the body. Titanium implants are the industry standard and have a lower risk of complication. They are more versatile than zirconia implants because we can customize them for the restoration. Our office uses guided surgery to place both types of implants. Contact our office today to speak to our doctors and see which one would be best for your case. Oil Pulling…Is it effective for dental health? A lot of our patients have been asking us lately about oil pulling. For those of you who are not familiar with oil pulling, it involves swishing a tablespoon of oil (coconut oil, sesame oil, olive oil, etc) in your mouth for twenty minutes. In the process, you “pull” the oil in between your teeth to help keep it clean. The oils will attract the fatty layer in bacterial cell membranes, which essentially would pull the bacteria from the teeth. Coconut oil, which you can find at any local grocery store, has a “magical” reputation. It has antibacterial properties, which has been said to help everything from your immune system to acne and now your teeth! But what is the science behind it? Coconut oil has antimicrobial activity and is effective against S. mutans and Candida albicans. Unlike chlorhexidine (also used in mouthwashes for its antimicrobial properties), coconut oil does not cause brown staining and altered taste sensation. Oil pulling supposedly draws toxins out of the blood. The exact mechanisms behind this claim remain unclear. 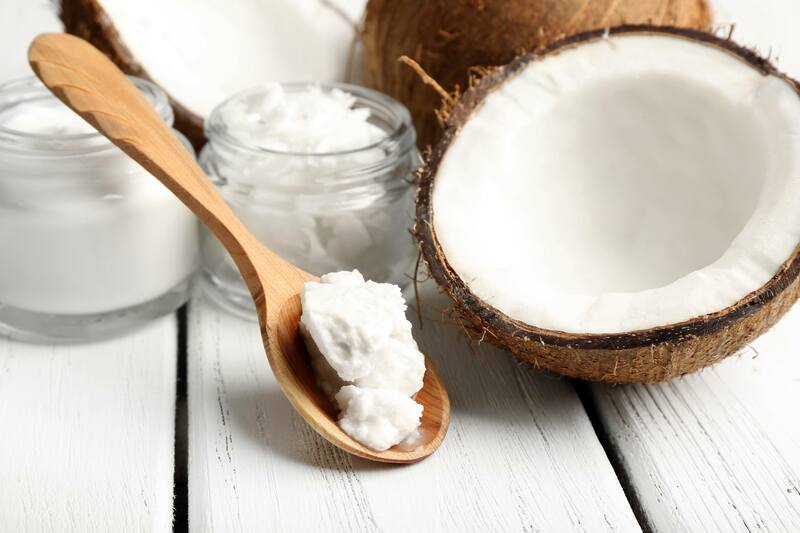 Studies show that there was a statistically significant reduction of plaque upon oil pulling using coconut oil. Oil pulling runs the risk of developing lipid pneumonia. Oil may be unintentionally aspirated during oil pulling. If the oil contains high levels of bacteria, then it may cause an infection in your lungs. Oil pulling has been shown to improve oral hygiene when practice correctly and regularly. Our office recommends that if you want to use the benefits of oil pulling, you can add it to your oral hygiene routine of brushing and flossing! Oil pulling requires at least twenty minutes to be effective. If you are short on time and want the benefits of oil pulling/coconut oil, try Cocofloss! We carry it at our office. It’s thick, fluffy fibers are infused with coconut oil. Flossing takes less than a couple of minutes and is the most time effective way of removing debris from in between your teeth! Shanbhag VK. Oil pulling for maintaining oral hygiene – A review. Journal of Traditional Complementary Medicine. 2016;7(1):106-109. doi:10.1016/j.jtcme.2016.05.004. Gbinigie O. Effect of oil pulling in promoting oro dental hygiene: A systematic review of randomized clinical trials. Complement Ther Med . 2016;26:47-54. doi:10.1016/j.ctim.2016.02.011. It’s that time of year again! The holidays bring parties and more time with family and friends. We may be indulging in wine a little bit more around the holidays. 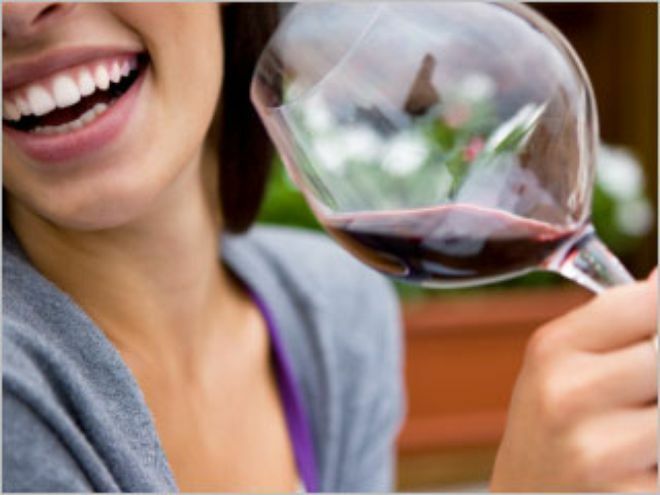 Whether you are an avid wine drinker, or just a glass or two at parties, chances are your teeth are paying the price. Red (and white) wine, just like coffee, grape juice, and tea, can stain your teeth! Why does red wine stain my teeth more than coffee? Chromagens: Red wine contains a higher concentration of chromagens, pigment producing substances that bind to enamel and stain teeth. Acidity: Wine (and other alcoholic beverages): The acid in wine, soda, and alcoholic beverages actually dissolves (or “etches”) tooth enamel on a microscopic level. This makes the tooth more susceptible to accepting pigment and pick up whatever color of what you’re eating or drinking at the time. With time, enamel erosion can cause more of the dentin to show through, causing the appearance of yellow teeth. Tannins: Tannins are molecules that want to hold on to tooth structure and to chromagens, helping the two bind together and stain even further. What can I do to prevent wine teeth? Eat some cheese – Cheese, proteins, or oils can help create a barrier on your teeth and can help prevent the pigments from staining your teeth. Broccoli, celery and other fibrous foods can help “scrub” away the stains from your teeth while you enjoy a glass of wine. Don’t brush right away! It can actually do more harm than good due to the high acid levels and susceptible enamel. Wait at least 30 minutes after consuming acidic foods and beverages before brushing. In that 30 minutes, try rinsing or chewing gum to help reduce the acidity in your mouth. Use a straw – Wine through a straw sounds funny, but it can reduce the amount of wine that comes in contact with your teeth! This holiday season, remember to take a break and have fun. Enjoy your time with loved ones and indulge if you must! We believe that everything is okay in moderation. Our office wishes you a very happy holiday season! Flossing is an important part of your daily routine. Our office, along with the American Dental Association, reiterates that flossing is an important and vital part of your daily oral hygiene regimen. Although recent articles in the news have suggested that the effectiveness of flossing has not been scientifically proven, there is simply no other way to clean the surfaces between your teeth! Flossing loosens and scrubs away plaque (a slimy, goopy mix of bacteria) that your toothbrush can’t reach. The bacteria in plaque releases toxins. When the plaque is left there and the bacteria is left to accumulate, our gums become irritated and inflamed (known as gum disease, or gingivitis). Bleeding gums when flossing is a sign of inflammation. With time, it can lead to the loss of jaw bone tissue as your bone breaks down to retreat from infection. This is known as periodontitis, which can lead to the gradual loss of bone and eventually, your teeth! What is the best method to clean between my teeth? We recommend that you use floss to clean between your teeth. Waterpiks are available at the local Target and CVS; they are better than nothing but do not mechanically remove the plaque located on interdental surfaces. Waterpiks act to dilute the bacterial count but do not remove the source of the bacteria! They are good for using in deeper pockets or with patients who have braces and need to flush out debris. When is the best time to brush my teeth, before or after? Either! You will hear different recommendations from different dentists. We just want you to do what’s best for you and what makes it easier to remember flossing. Some patients prefer to do it before brushing, to get the “harder” task out of the way first. Others prefer to do it afterwards, when there’s less “gunk”. Do what works for you! What is the difference between all the types of floss? When you walk down the aisle at the store, it can be overwhelming to look at the different types of floss out there! There is waxed floss and unwaxed floss. A lot of people prefer waxed floss because the wax makes it easier to slide in and out of your teeth. Unwaxed floss is easier to go between tighter teeth, but it is more prone to fraying. We recommend SuperFloss or floss threaders if you have braces, lingual retainers, or bridges. What floss do you have in your office? A cavity is an area of tooth that is demineralized, meaning it has decayed and is permanently weaker. Cavities can appear as, quite literally, holes in your tooth. They can also present as soft spots or changes in the texture or opacity of the tooth. Plaque and acid! Plaque contains oral bacteria that uses sugar, present in our diet, to make acid. They not only make acid but thrive in an acidic environment. The acid eats away at your teeth, pulling minerals away from the tooth structure and leaving holes. Our mouths contain a balance between both healthy and cavity-causing (acidogenic) bacteria. Prolonged acidic conditions enable the bad bacteria to thrive and inhibit or kill the healthy bacteria. Can I catch cavities from someone else? Not really. However, we can transfer cavity-causing bacteria from one another. That means mothers passing it onto their children when sharing utensils or “cleaning” a pacifier that has fallen onto the floor by putting it in their mouths. Or between significant others! Most of the time you won’t have any symptoms! However, when cavities progress you may experience toothache, sensitivity, see visible holes or pits in your teeth, or see dark spots on your tooth. Sometimes you may have pain when eating or drinking sweet, hot or cold food. Your dentist can diagnose cavities with a clinical examination (using both visual and tactile techniques) and/or dental x-rays. Bitewing x-rays can show cavities that cannot be found in the clinical exam. HOW DO I KNOW IF I’M AT HIGH RISK FOR CAVITIES? Take our cavity risk assessment quiz to determine your risk! Brush and floss after eating processed, sugary foods and candies. See your dentist for regular check-ups! Like most products, not all dentures are created equally. When getting dentures to replace multiple teeth, everyone wants something that is not only natural looking, but comfortable as well. Our office provides Geneva 2000™ dentures, which are custom made to fit YOU! We’ll make sure your dentures are comfortable and have a perfect fit so you won’t have sore spots or need denture paste or adhesive. No one, not even you, will be able to tell the difference! When we say they’re custom made for you, it not only means they fit great, but it has a superior aesthetic compared to other dentures. We take into account our patient’s gender, personality, and age to find the best, most natural look for you. Geneva 2000™ dentures use only teeth that are individually sculpted for both men and women. Male patients will often have longer, more square shaped teeth. Female patients tend to fit a more ovoid, tapered shape. Besides, proper fit and aesthetic, Geneva 2000™ dentures uses AutoCentric Occlusion, which was developed by the Swissdent Foundation over 35 years ago. This occlusal scheme offers better lower denture stability. It also has a lower rate of complications, such as major bone loss in the lower jaw due to long term use of poor fitting dentures. This allows for greater ease with function when our patients eat and speak. Geneva 2000™ dentures wearers look and feel so natural that our patients often forget that they are wearing dentures. If you are interested in getting dentures or are unhappy with your current dentures, contact our office today for a free consultation to see if Geneva Dentures are right for you! Should Silver Fillings Be Replaced? Amalgam (silver) fillings have been used in dentistry for over 100 years due to their durability and low cost. Many of our patients are concerned if the mercury in the filling can result in adverse effects to your health. Dental amalgam is an alloy composed of mercury, tin, silver, copper, and other trace metals. Over 50% of dental amalgam is composed of mercury, which is used to react and bind with the other metals to form an amalgam. Dental amalgam releases low levels of mercury in the form of a vapor, which can be inhaled and absorbed by the lungs. Research shows that mercury absorbed in high enough concentrations can cause health problems. That being said, the amount released is well below the FDA accepted daily intake of .4 micrograms per kilogram of body weight. Many studies have been done studying the health effects of amalgam and none have demonstrated that it has adverse effects on the body. The American Dental Association, U.S. Centers for Disease Control and Prevention, US Food and Drug Administration and World Health Organization agree that based on extensive scientific evidence, dental amalgam is a safe and effective cavity-filling material. Should I Replace My Silver (Amalgam) Fillings? When it comes to replacement, amalgam fillings should be treated like any other dental restoration. We do not advise our patients to change their silver fillings unless there are signs of decay, chipping, cracks, or poor margins. It is best left alone unless it poses a cosmetic concern for you. What Do We Use in Our Office? In our office we use resin-based composite (tooth colored) fillings that are selected for the perfect shade to match your teeth. When we remove cavities, we are removing decayed tooth structure. The remaining tooth is quite fragile. Composite, unlike amalgam, bonds to your teeth and can actually reinforce the strength of the weakened tooth. With composite, we also do not have to remove healthy tooth structure just to achieve the minimum measurements for amalgam to perform adequately. The margins are also sealed, which prevents further decay. If given the choice, we believe that composite provides a better, more conservative and esthetic restoration. That being said, if your existing amalgam fillings do not exhibit any defects they are best left alone! We hope you all had a fun and safe New Year’s Eve and that 2016 is already off to a wonderful start. The start of the year means a clean state, a fresh start, and lots of excitement for the year to come! 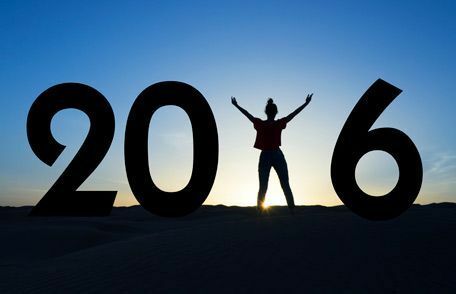 It’s the perfect time to make changes, big or small, to your life to make this your best year yet! Here are 10 easy tips and tricks that you can do to improve yourself and your smile. Giving up soda is an easy way to cut back on sugar and calories. Frequent consumption of acidic or sugary drinks increase decay rates dramatically. Instead, opt for flavored water or tea for a healthier alternative. We don’t drink enough in the day, especially with the colder weather. Water is the healthiest beverage for your smile and your body. In the new year, many of us are heading back to the gym. Athletes are especially at risk because of the effects of sports drinks. When you head to the gym, make sure that you bring a bottle of water and make sure to finish it after your workout. Busy, stressful schedules can lead to grinding, clenching, and TMJ pain. Make sure to take some time for yourself to slow down and breathe. Find something that helps you relax at the end of the day, like watching Netflix, yoga, or pouring yourself a warm cup of your favorite tea. A mouthguard worn at night can help prevent tooth damage and muscle soreness. As we all know, the effects of smoking can lead to serious health complications for both your body and your teeth! Smoking contributes to gum disease, bone loss, and oral cancer. Smokers tend to have dark, discolored teeth and are more likely to lose their teeth as non-smokers. Quitting smoking is not easy, but it’s the best thing you can do for your health. If you haven’t kicked the habit yet, now’s the time! Please! This does not need explanation. Teeth are not meant to be used to break ice cubes, open beer bottles, or trim your nails. These habits put you at risk for breaking your teeth or injuring your jaw. When was the last time you changed your tooth brush? The American Dental Association (ADA) recommends that you replace your toothbrush every three to four months, or sooner if the bristles are frayed. Old, worn out toothbrushes harbor bacteria and clean less effectively. Brushing and flossing your teeth are the most effective things you can do to take care of your smile. If you don’t brush and floss as recommended, plaque can develop on and between teeth causing decay and gum disease, which can in turn lead to other health problems. We recommend brushing twice and flossing once each day. Time to step up your oral hygiene in 2016! Brushing with a hard toothbrush, brushing too hard, or brushing incorrectly can damage teeth and irritate gums. If you are using a manual toothbrush, be sure to use a soft one and brush at a 45 degree angle (see picture above). If you want to use an electric toothbrush, we recommend the Rotadent brush which is only sold at dental offices, including ours! 10. Visit the dentist regularly! Don’t forget to come in for your checkups and cleanings. Regular appointments allow your dentist to monitor your dental health and address any concerns before they become bigger, more serious problems. If you haven’t done so yet, give us a call to schedule an appointment!